Looking for a job in Monroe County Indiana? 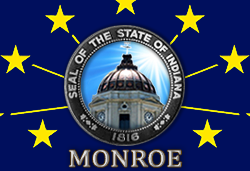 This Monroe County Indiana job guide is a resource for job seekers looking for legitimate employment opportunities in the region with an emphasis on government positions, top healthcare employers, public school careers, and major job boards. Monroe County Indiana had job openings on this review date. Positions found had included Probation Department Legal Secretary, Circuit Court Bailiff, Parks & Recreation Park Laborer, Probation/Community Corrections Probation Officer Assistant, Youth Services Bureau Part-Time Residential Specialist, Public Defender Paralegal, Health Department Environmental Health Specialist Assistant, and Health Department Health Education Assistant. A variety of opportunities become available working for the City of Bloomington throughout the year. A sample of openings found had included Community Events Coordinator, Long Range Planner, Planning & Transportation Director, and Seasonal Laborer. The Bloomington Police Department was also accepting applications for the position of Police Officer. The Bloomington Police Department is a full-service police agency. The Bloomington Fire Department recruits new staff on a needs-basis. Monroe Hospital is a part of Prime Healthcare and provides high quality healthcare for the region. Open positions in the network often include careers such as Staff Nurse Emergency Department, Registered Nurse RN Telemetry Per Diem, Staff Nurse Per Diem ICU, Radiology Technologist Per Diem, Staff Nurse Med/Surg, Director Patient Financial Services, Medic, Nursing Assistant Med-Surg Telemetry, Financial Counselor, Staff Nurse - Float Per Diem, Biomed Technician ll, Controller, Registered Nurse RN Emergency ER, Social Worker, Speech Language Pathologist, Rigistered Nurse Nights, Nurse Practitioner, Medical Assistant, Registered Respiratory Therapist RRT, Receptionist, Physician Assistant, EPIC Senior Analyst, Certified Nursing Assistant CNA Medical, Registered Nurse ICU, Director of Pharmacy, Pharmacist, Physician Billing Associate, Clinical Laboratory Scientist, Patient Monitor PCT, Medical Technologist, Registered Nurse Ambulatory, Scheduler, Environmental Services Assistant, Labor & Delivery Nurse RN, Registered Nurse Surgical, Licensed Practical Nurse LPN, Medical Assistant Jobs, EVS Tech, RN Home Health, PBX Operator, Software Engineer, MRI Technologist, Radiology Technologist PRN, Registered Mammography Tech, MLT Medical Lab Tech, Ultrasound Tech Per Diem, Medical Technologist Per Diem, and Certified Phlebotomy Technician. When you join the Indiana University Health team, you join a nationally ranked and regarded system dedicated to providing quality, excellence and respect. Recognized as a top healthcare system by U.S.News & World Report for nearly two decades, IU Health is the most preferred system in Indiana and employs the most highly skilled physicians. Job openings found had included Pharmacy Technician, Paramedic ALS/BLS, Emergency Medical Technician EMT, Sterile Processing Tech I, PCU Registered Nurse, Childbirth Educator RN, Unit Secretary, Stress Care Center Registered Nurse RN, Registered Nurse-Emergency Room, Registered Nurse Cardiovascular, Respiratory Therapy Assistant, Patient Care Assistant, Physician Assistant, Home Care RN, Home Health Aide HHA, Registered Nurse Med Surg, Pediatric RN, Specialist Logistics, Registered Nurse Oncology, Transfer Registered Nurse, Primary Care Nurse Practitioner, Technologist Echo / Vascular, Respiratory Thereapist, RN Nurse Manager, Housekeeping, Medical Transporter, OB Registered Nurse, Licensed Practical Nurse LPN, CT Technologist, Histotechnologist, Physical Therapist, Home Care Physical Therapist, Psychiatrist, Medical Assistant, Audiologist, Medical Technologist, Pharmacist, and Anesthesiologist. Hearthstone Health Campus provides adult day health and assisted living services. Careers include positions such as Unit Manager LPN Licensed Practical Nurse, Dietary Aide, Registered Nurse RN, Licensed Practical Nurse LPN, Certified Nursing Assistant CNA, Dietary Aide, Caregiver, Maintenance Manager, MDS Coordinator, Cook, and Housekeeper & Laundry Assistant. Jill's House is always looking for energetic and caring people to add to their staff. If you're interested in employment at Jill's House, please complete the application and email them. Meadowood Health is a part of Five Star Senior Living and provides independent living, respite care and short term stays, rehabilitation, and skilled nursing care. Openings found included Admissions Coordinator, Dietary Aide, CDL Driver, Licensed Practical Nurse, Receptionist, Registered Nurse, Staff Security, and Waiter - Server. Bell Trace Senior Living Community is a part of CarDon & Associates. Jobs found included Personal Services Attendant, Prep Cook - Line Cook, Certified Nursing Assistant, Nurse Aide (CNA), Registered Nurse RN, Licensed Practical Nurse LPN, Dining Services-Dietary-Server-Food Service, HR Business Partner, Managed Care Nurse RN/LPN Call Center, and more. Home Instead Senior Care had job opportunities in Bloomington for Caregivers. Caregiver shifts are available including overnights, day shifts, evening shifts, long and short hour shifts for senior care. The work is varied and allows for a great deal of creativity and independence. Elder Care Connections Caregivers benefit from an extensive orientation and training program that includes universal health precautions, proper body mechanics, and HIPPA guidelines. Brookdale Bloomington provides Assisted Living services to seniors in Bloomington, Indiana. Brookdale Bloomington had employment opportunities for Activity Assistant, Wellness Nurse LPN, Certified Nursing Assistant CNA, Maintenance Technician, Lead Resident Care Associate, Licensed Practical Nurse LPN, and Lead Housekeeper. The Monroe County Community School Corporation is a large school district that has ongoing employment opportunities. During review there had been open positions available such as Cheer Coach, Assistant Track & Field Coach, Support Staff Job Postings, I-A Custodial Supervisor, Bus Monitor, Transportation Bus Driver, Remediation Aide - Academic Lab, Summer School Site Coordinator Grades 1-3 Reading and Grades 4-5 Math, School Aide, ELS & Math Aide Grades 6 & 7, SAC Aide, Activity Bus Driver, Substitute School Nurse, Substitute Health Aide, SAC Preschool Aide Ready, Sub Cook, Athletic Bus Driver, Custodian, Special Education Teacher, Permanent Special Education Substitute Teacher, ABE Teacher Part-Time Supplemental, Business Teacher, High School Summer School Teacher, English as a New Language School Teacher, Grades 4 and 5 Math Teacher, Grades 1, 2 and 3 Reading Teacher, 6th and 7th grade ELA and Math Teacher, Grades 2 and 3 Reading with TAP (Technology and Projects) and Grades 2nd through 6th Drama Teacher, Substitute Teacher, Physical Education Teacher, Homebound Instructor, Administrative Job Postings, Hoosier Hills Career Center, Assistant Superintendent for Curriculum and Instruction, and Substitute Teaching Job Postings. Richland-Bean Blossom Community School Corporation (RBBCSC) is a school system serving nearly 3000 students in northwestern Monroe County, Indiana. Here employment listings were found such as Instructional Assistant, Cook / Assistant Cashier, Bus Driver, Substitute Monitors, Substitute Bus Driver, Substitute for Nutrition Services, and Substitute Teachers. Seven Oaks Classical School offers a K-12 traditional education. Teachers at Seven Oaks Classical School are hired based upon their intellectual accomplishments, moral seriousness, and skill in the art of teaching. During review faculty and staff positions were found such as Kindergarten Teacher, 1st Grade Teacher, Middle School Math Teacher, Special Education Paraprofessional, Receptionist / Registrar, Custodian (full-time, available immediately), and Before and After-school Care Coordinator (part-time, available immediately). The Project School is a chartered public school (free and nonprofit) with independent board governance. The Project School has a staff of close to 50 full time, part time, and contracted employees, including teachers, instructional assistants, administrative and facilities staff, and therapists. Indiana University is top ranked in academics. Bloomington is the flagship residential, doctoral-extensive campus of Indiana University. Here you'll find faculty and support staff positions available year round. Ivy Tech is the largest singly accredited community college system in the nation serving the entire state of Indiana with 32 degree granting locations throughout the state, and classes held in more than 75 communities. The Bloomington Chamber of Commerce maintains a job bank. You can upload your resume for potential employers to see. The Chamber is also a good place to find local businesses inside their searchable directory. WorkOne Indy helps job seekers choose a career and find employment. They also provide interviewing tips and resume development. Hoosiers by the Numbers provides data from the Indiana Department of Workforce Development: Find businesses by searching geography, employment size and/or industry. Use for career exploration and job search assistance. A good resource to explore salary expectations, career area growth projections, regional job outlook, and more.